On Life. Life! I'm so glad to be living, dear reader, yet I fear that this particular season of life has led me to become a random once-a-week blogger. It's not from a lack of things to say; I have more ideas jotted on slips of paper and swirling in my head than I can manage. Nor is it from a lack of desire; I love the quiet moments when I sit at the computer and harness those ideas into words. Basically, it's that I have this job that requires me to assign work to my students that I, in turn, must grade (vicious cycle, really), and these three children who need daily guidance and food and homework help and love and refereeing. Yes, that's basically it. On Date Nights. This weekend Joel and I went on an impromptu date, our first in months. As we strolled though a store before our movie started, I thought it would be nice to spritz on a little perfume from a tester. In case a similar thought crosses your mind while you're on an impromptu date with your husband, please do something that I neglected: namely, to sample actual perfume instead of accidentally applying men's cologne. There's a first time for everything, and for me on this past Saturday night, it was going on a date while smelling like a man. Granted, a really nice-smelling man, but a man nonetheless. On Tom Hanks Movies. Have you heard about Tom Hanks' latest move, Bridge of Spies? You should, but if you haven't, it's about spies. And a bridge. With that essential information covered, let me tell you that I love how Tom Hanks so convincingly portrays seemingly average men who encounter extraordinary situations. Plus, midway through this particular movie (which was excellent), I had an epiphany and leaned over to thank my husband for not choosing a career in the fields of espionage or hostage mediation. It's just easier this way. On Halloween Candy. 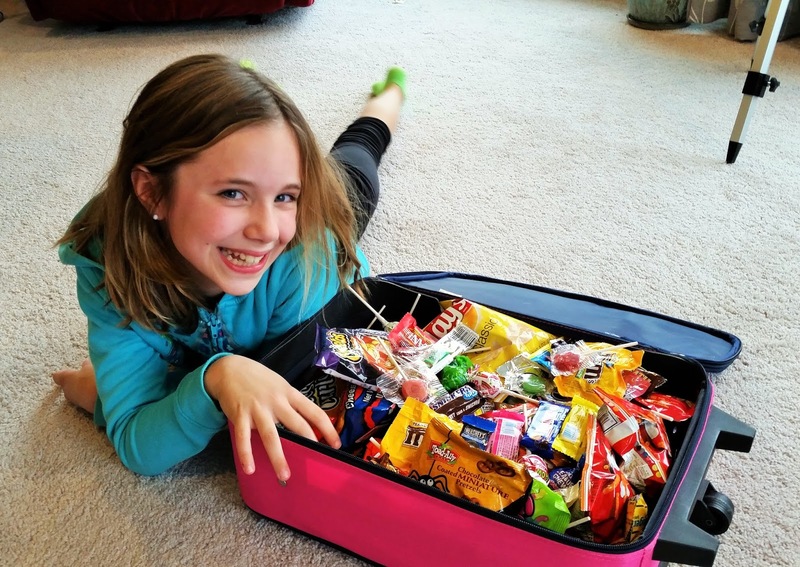 I knew that my oldest daughter had amassed an absurd amount of candy while trick-or-treating, but when she decided that she needed something a bit larger to contain it all... well... this is disturbing. On a Random Tumbleweed. 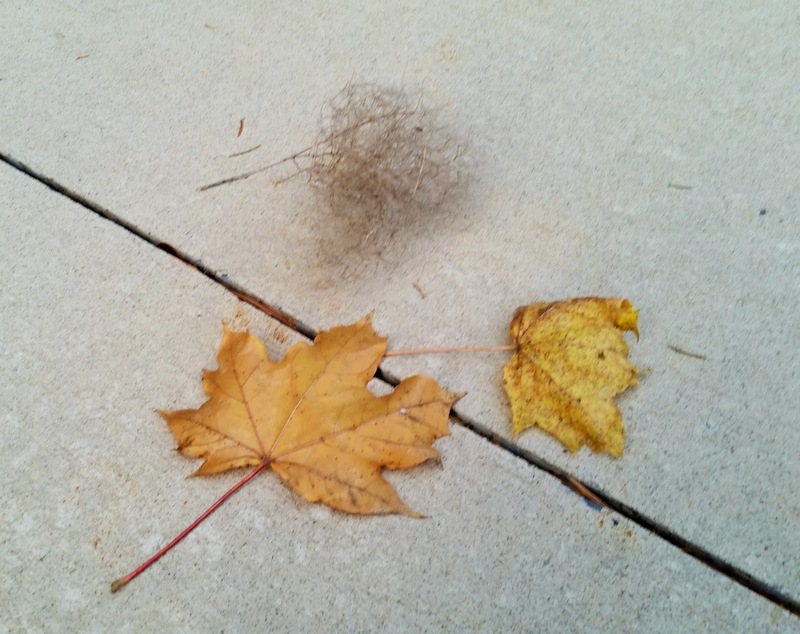 While taking a walk around my neighborhood, I saw a tumbleweed blow across the sidewalk. A tumbleweed! Admittedly, it was the smallest, scruffiest tumbleweed you could imagine -- more hairball than robust -- but its existence made me smile. This is how the tumbleweeds roll in central Pennsylvania. On the Extra Hour of Sleep. Ha. That never really happens, does it? Oh, Daylight Savings Time, you continue to mock us with your empty promises.